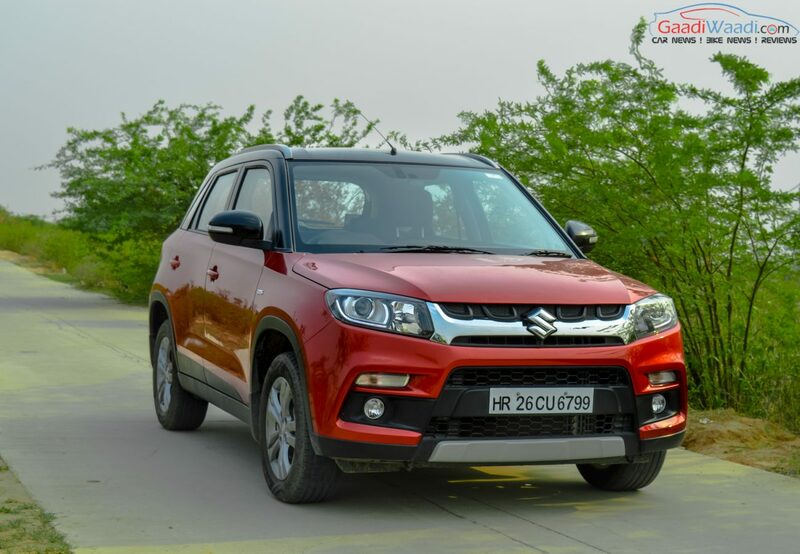 Maruti Suzuki is inching toward capturing 50% share in Indian car market. In September, 2016 the India’s largest automaker has sold a total of 1,37,277 units compared to its 1,06,083 units of sales in September, last year. This marks a 29.4% rise in sales volume of the company, which earned it 49.2% market share. 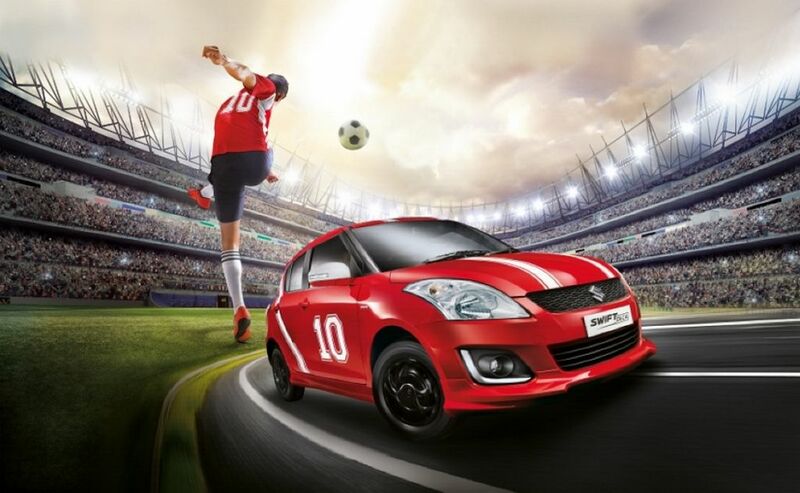 Right ahead of festive season Maruti Suzuki is seeing good fortune with this success. The small car market in India is certainly the bestselling segment, and Maruti Suzuki is undoubtedly the leader in the segment. Apart from that two relatively new models Baleno premium hatchback and compact SUV Vitara Brezza has played a very crucial role in Maruti’s recent growth. Data also reveals that, entry level models like Alto and Wagon R has also seen a rise of sales by 24.8%. Maruti Suzuki also sold 7.67lakh cars in the second-quarter of FY2016, which ended in 30th September. This second-quarter has seen a growth of 10.4% from the corresponding period of last year, when the company sold 6.95lakh cars. Festive season always fetches good sales figure for every company, and Maruti Suzuki is also hoping to grab 50% share in a few days. During second-quarter, FY2016 the automaker sold 7.05lakh cars in Indian domestic market, which marked a 12.1% growth over 6.29lakh cars sold in corresponding period in 2015. While in domestic market Maruti Suzuki has seen immense success in last quarter, export has declined by 6.3%. In second-quarter the company has exported 61,543 units, while in second quarter of FY2015 it exported 65,701 units. 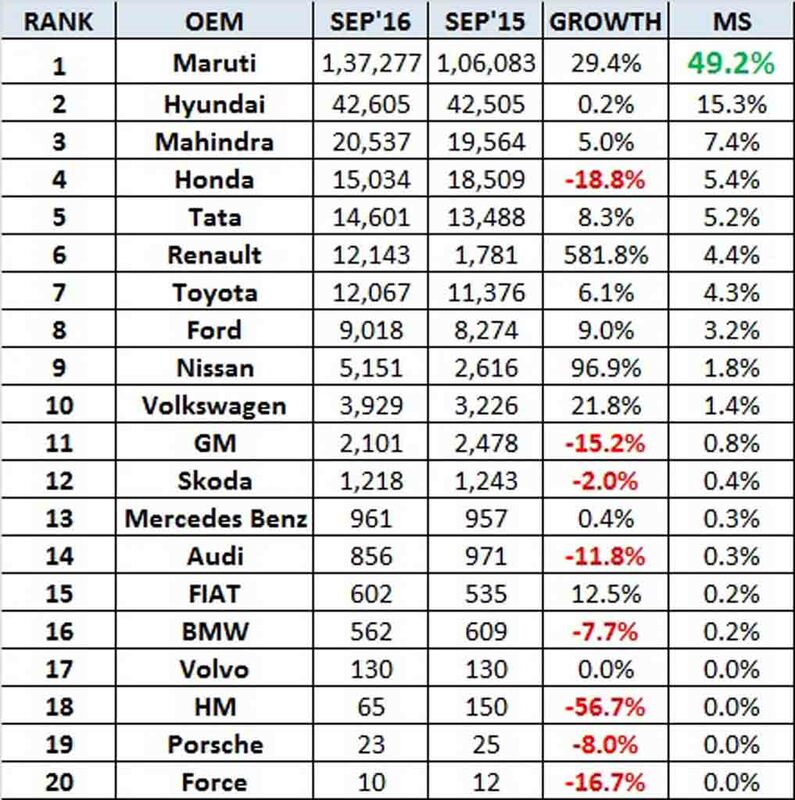 In the September, 2016 sales chart India’s second largest carmaker has sold 42,605 units compared to 42,505 units in September, last year. The South Korean automaker presently holds 15.3% market share in country’s car market. 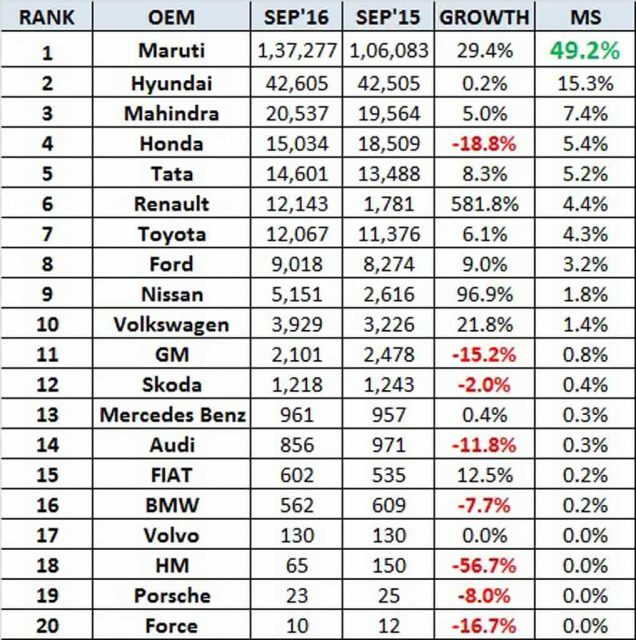 Other two Indian automakers Mahindra and Tata Motors have sold 20,537 units and 14,601 units in September, 2016.